CAPE CANAVERAL, Fla. — Even though NASA's iconic space shuttle program is ending in a matter of weeks, the future of American human spaceflight remains bright, according to NASA chief Charlie Bolden. 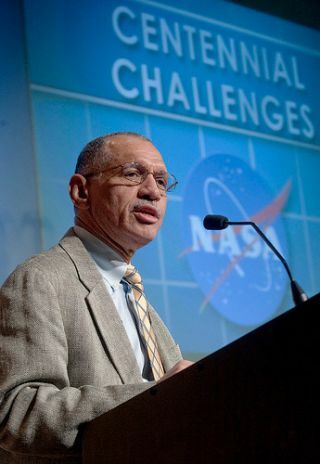 Private spaceflight firms will pick up NASA's slack before too long, ferrying humans to low-Earth orbit and back relatively cheaply and efficiently, Bolden told reporters here at NASA's Kennedy Space Center on Thursday (July 7). And handing off that taxi service to commercial companies, Bolden added, will free the space agency up to do what it was meant to do: explore further afield in our solar system. So the nation is not abandoning human spaceflight, despite a pervasive public perception to the contrary, he said. Bolden was at Kennedy Space Center (KSC) to announce and celebrate an agreement between the space agency and the spaceflight firm Sierra Nevada Corp.
Sierra Nevada is developing a small space plane called the Dream Chaser, which is in the running to transport NASA astronauts to the International Space Station and back after the shuttles retire. That retirement will come after the shuttle Atlantis' STS-135 mission, which is slated to launch today, though bad weather may push it back a day or two. The new agreement allows Sierra Nevada to use some of the facilities and work force here at KSC for its own purposes. That sort of collaboration between NASA and the private sector underscores where the nation's human spaceflight program is going, Bolden said. NASA will continue to encourage firms to develop spacecraft capable of carrying humans to the International Space Station and other (future) destinations in low-Earth orbit. The agency recently awarded four companies — Sierra Nevada, SpaceX, Blue Origins and Boeing — a total of $269 million toward this end, under the second phase of its Commercial Crew Development program. "We're really pushing for a robust commercial space industry to relieve us of the responsibility for paying for access to low-Earth orbit," Bolden said. "That's going to give us the opportunity to focus on exploration." While helping private spaceflight find its way forward, NASA is working on its own future path for human spaceflight. The agency has been charged with getting astronauts to an asteroid by 2025 and then on to Mars by the mid-2030s. The spacecraft that will do this is called the Multi-Purpose Crew Vehicle (MPCV), which is based heavily on NASA's Orion capsule. Orion was originally developed under former President George W. Bush's moon-oriented Constellation program, which President Barack Obama cancelled last year. But NASA has not decided on the architecture yet for the heavy-lift rocket system that will loft the MPCV into the heavens. The agency hopes to make a final decision on this rocket, known as the Space Launch System (SLS), by the end of the summer, officials announced today. The agency already has a reference design in mind for the SLS but is still vetting it. That process should be over soon, NASA associate administrator Lori Garver told reporters here. "We are looking at all the cost evaulation," Garver said. "We have an independent cost evaluation coming through, and we still hope to be able to announce, I think, by the end of the summer." Bolden acknowledged the importance of picking a good SLS design, and of developing it in a timely fashion. "The decision on a heavy-lift launch vehicle is going to be a very critical and very expensive decision for the nation that's got to carry us into this next era," he said. "We're close to making a decision on the configuration, but not quite there."